–Frank Lloyd Wright, recognized in 1991 by the American Institute of Architects as “the greatest American architect of all time.” His home schooling mother used these toys to educate him. It is interesting to note that he wasn’t introduced to the blocks until he was nine years old. It is never too late! After exploring objects in Spielgaben 1 and Spielgaben 2, Spielgaben 3-6 provides various wooden figures such as 1″ cubes, cuboids, flat square blocks, 1/4″ square columns, triangular prisms, semi-circular columns, concave parts and concentric rings to make shapes and teach the relationship between a whole and its parts. Spielgaben 3-6 are designed to extend geometric understanding by introducing the concepts of symmetry, the diagonal and the cubed root. Child will slowly be introduced to the concepts of breaking a cube down into solids of different sizes. The methodical nature of this process is important. The child is allowed to freely discover geometric rules at a simple stage and then apply and further is knowledge as the Spielgaben grow in complexity. In Spielgaben 3-6, a child is given more room to explore multiples of twos and threes and other exciting principals of arithmetic. Your child will develop a strong understanding of how different geometric solids work together to create structures. The math discoveries that Spielgaben 3 – 6 encourages your child will amaze you. While Spielgaben 3 – 6 are designed to work together, each individual part comes with its own unique purpose to helps kids learn and develop. Encourage children to not simply dump all of the different shapes from Spielgaben 3 – 6 out, but rather to carefully observe each of the shapes and consider its use before deliberately placing it. As you work with all of these shapes, be careful not to tell children what to build or what figures to make. Learning comes from allowing children to figure out how to manipulate the shapes and allowing them to take control over what the shapes create. Even when using the shapes as part of mathematical problems, allow children to move the shapes into position before counting them out or solving a problem. This allows the learning to come from them rather than forcing the concepts on them. Here are detailed breakdown from Spielgaben 3 to 6. The first individual shape kids encountered is a set of 1” cubes. 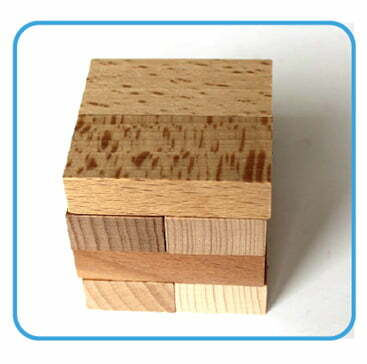 These small wooden cubes can be combined to create a much larger cube. While in the set they are not stored in the shape of a cube, parents may opt to create a larger cube out of the smaller cubes before introducing them to children. 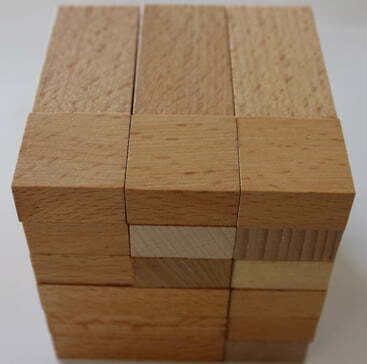 Children can then deconstruct the cube and begin to understand how a whole can be constructed out of many different parts. These individual cubes have a large range of uses when it comes to learning and play. At first, you may want to have children simply explore the shapes. They can feel the sides, the angles, the faces, and count them to see how many each cube has. From there, children can move into making different objects from the cubes, using them as basic building blocks to build symbolic representations of favorite objects. Some children may simply build a tower or a house, while other may create a car, a cat, or a whole host of other items. Children will begin to see how these smaller parts can combine to make something new. They will also begin to learn about the process of creation and deconstruction. After working so hard to build a favorite object or a large tower, children may feel sad when it falls or when they’re told to take it apart and put it away. However, children will begin to understand that from the destruction of the old comes the potential for new. The one-inch cubes also serve as the ideal tool for mathematical representation. Lining up blocks and counting them one by one helps children begin to understand the names and concept of numbers. Grouping the blocks into smaller sets gives children a visual representation for basic addition and subtraction problems and, later, can also be used to help understand grouping in multiplication and division. With the one-inch cubes, children can also look at the mathematical side of parts equaling a whole by using the cubes to represent fractions and understand proportions. In Spielgaben 4, children discover a set of cuboids or rectangular prisms. Similar to the cubes, the shapes are all uniform. Unlike the cubes, each side is not the same length. This helps introduce children to the concept of unequal proportions. Children can use the cuboids much like the cubes when it comes to building, but the cuboids open up a whole new range of building options. The rectangular prisms do not have to be used to make a completely-filled whole. Instead, they can used as bridges and enclosures, helping children to learn more about the concept of space. As children build with the rectangular prisms, they also learn about concepts such as weight and balance, as it takes a precise placements to ensure the pieces stay where place when used in building. Children can also gain an understanding of motion with the cuboids. When stood up vertically, resting on their narrowest side, the cuboids have a domino-like shape. Children may opt to place the cuboids in a straight line and knock one down in an attempt to create a domino-like effect. This is another way for them to learn about force and how its impact can pass through multiple objects. They may opt to experiment with different configurations. For example, children could arrange the cuboids like bowling pins and tap the one in front or knock it down with a ball to see what happens. The cuboids in Spielgaben 4 can also be combined with the cubes in Spielbagen 3 to help children understand how different shapes can represent the same whole. 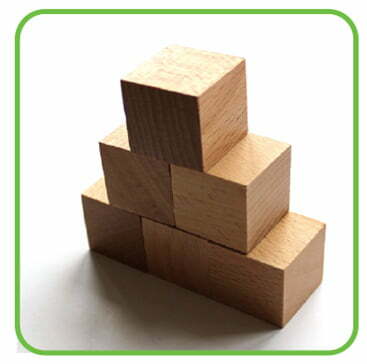 For example, children may notice that they can recreate two rectangular prisms stacked horizontally on top of one another by stacking a set number of cubes in the same way. 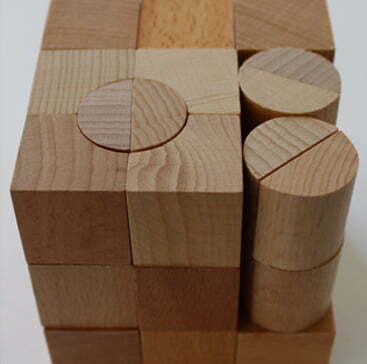 The cuboids, too, can be used to help teach fractions and division, as children build up objects and slowly deconstruct them into their individual parts. With the cuboids, construction also becomes more about creating patterns and beautiful shapes than simply creating and deconstructing objects. The length of the cuboids allows children to experiment with more unique shapes and patterns by twisting and turning the cuboids in different directions as they place them together. So they may begin to create their own images, rather than simply constructing familiar objects. 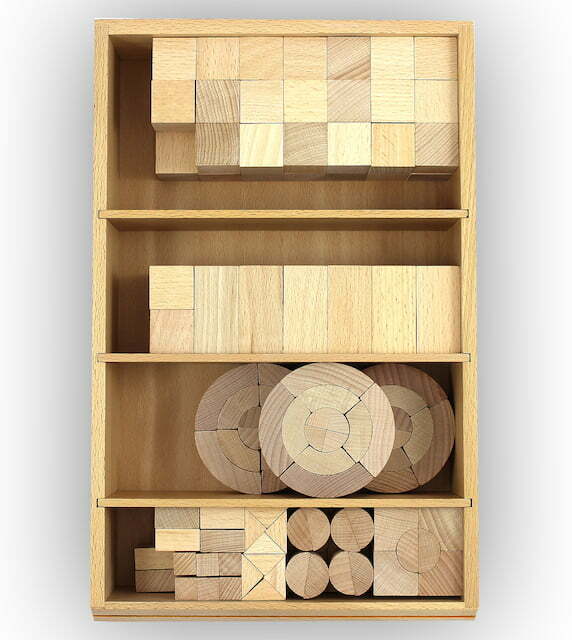 The semi-circular columns and concave parts of Spielgaben 5 continue the process of creating patterns and making beautiful images out of the wooden blocks. Children are re-introduced to the circular shapes they discovered in the balls of yarn in Spielgaben 1 and some of the geometrical figures in Spielgaben 2, but those shapes are deconstructed, causing children to learn even more about geometry and the concept of arcs. These shapes don’t always fit perfectly into towers and cannot usually be used if the child desires to add more to the top of them, so children have to re-organize their thinking and start to incorporate problem-solving skills as they build. How children use the semi-circular columns and concave parts is entirely up to them. They will learn that only certain sizes of shapes can be used to make perfect circles, which they may use to encircle structures made with the cubes or cuboids in Spielgaen 3 and 4. They may turn a semi-circle on its ends and use it to represent a rainbow, referencing the colors they discovered in the balls of yarn in Spielgaben 1. The shapes can also be used to represent a host of new objects, for example, a set of rainbows placed in a row could become the Loch Ness Monster or, on their sides, become a snake or a flowing river. Children may also put together circles to represent the wheels of a car, but will note that just because they are circles doesn’t mean they will move like actual wheels. In rotating the shapes, children will begin to see how they differ from the other shapes they have been introduced to. 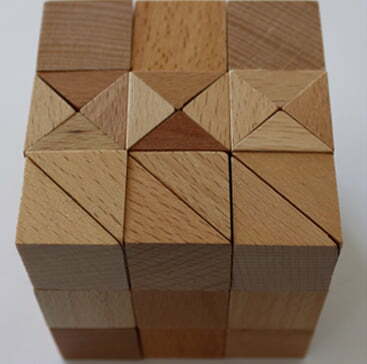 For example, when rotating a cube, children see essentially the same faces, sides, and angles every time. When rotating a cuboid, they see that some sides are longer and some are shorter. When rotating a semi-circle or a concave structure, they see that there are not as many angles and that some sides are smooth. When they place two semi-circles together, they begin to see that a circle has no angles or sides, which helps expand their understanding of geometry. Spielgaben 5B is a modified version of 5. It has 12 cubes, 12 small triangular prisms, 12 semi-circular columns and 8 matching concave parts. When half cylinders with matching concave parts are added to Spielgaben 5, the architectural possibilities of the set are enhanced, making this a true building set. Children will learn about solid figures that have rounded lines and experience the difference between straight lines and curved lines. Watch your child combine cubes with curves and semi-circular columns to construct large, gracious buildings. Spielgaben 5C is a modified version of 5. It has 3” cylinder divided into three concentric rings 1/2″ thick with 3 layers vertically and 3-fold division is maintained in both directions. As with the Spielgaben 8 rings and half-rings, the Spielgaben 5C produces some elegant and beautiful designs. The Curvilinear Series was developed, like many of original Froebel’s, after Froebel’s death. Froebel had laid the philosophical foundation for these versions in his book Education by Development, but their use was not formalized until much later. Purists have argued against adding to the traditional series, yet Froebel was clearly advocating the use of the curvilinear solids in his writings. As with the other sets, children will use this Curvilinear Spielgaben 5C to construct both the things they see in their world and the things they imagine: igloos, castles, bridge and the possibilities are endless. 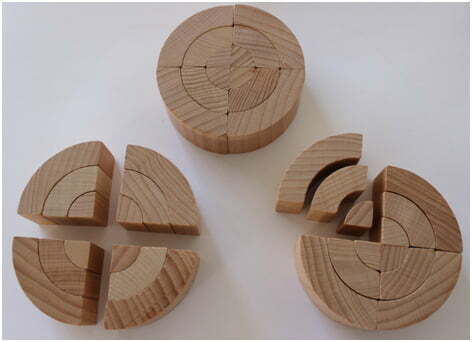 Children can divide the Curvilinear cylinder into halves, thirds, and quarters. Geometric concepts such as ring, disc, arc, diameter, radius and concentric can be discovered thorough play. The arcs can be rotated in different directions to prompt discussions of “curving over” and “curving under.” The quarter circle arcs of the Spielgaben 5C can also be used by older children to form letters of the alphabet. The Spielgaben 5C is more complicated and therefore more suitable for an older child. Like Spielgaben 5, 5C is especially well-suited for creating architectural constructions. Younger children might start with fewer pieces (one layer of 12 pieces) and gradually work up to using the entire set in pattern-making. Spielgaben 6, with its triangular prisms takes the concept of geometry even further. As children manipulate the objects, they will notice that some of the angles are sharper than the angles they’ve found on the cubes and cuboids. Once again, they will get the chance to use the shapes to represent objects and begin to understand how they can combine triangular prisms to make cubes, diamonds, parallelograms, and larger triangles. By adding the triangular shapes, children now have a whole host of geometric representations at their fingertips. This not only allows them to represent even more objects, but it encourages them to further discover the beauty that comes from making their own patterns and designs. These can be made as somewhat “flat” designs on a tabletop or used to make more intricate designs at the tops of towers and other structures children build. It is with these triangular prisms that children will be able to experiment more with architecture and, after playing with them, may be able to recognize more of the shapes they see in skyscrapers and other large buildings when they are out and about. After all, most roofs on homes are created in a triangular shape to allow items to allow water to roll off rather than sit on top. Children may experiment with these angles, seeing what objects they will hold or having fun rolling items off of them.